Generate and identify number and/or shape patterns. MYSTERY NUMBER- Use your place value knowledge to move those heavy number blocks and build the mystery numbers. PLACE VALUE PUZZLER- Funbrain will show you a number. Click on the digit in the number whose position is shown. Or correctly type in the rounded version of the number. 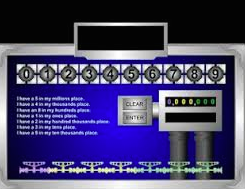 THE NUMBER FORMS GAME- Click on the matching standard form of a number before the time runs out. You have 10 seconds for each question! WHAT NUMBER IS SHOWN? Match the place value model that shows the correct number or write in the correct number. PLACE VALLUE TO THOUSANDS- This game will test your understanding of place value to the thousands place. EXPANDED FORM - Mathman teaches place value expanded form the fun way with this maze style math game. Rounding Numbers Pirate Game is a fun online activity that allows students to earn points and upgrade their ship as they try to discover the hidden treasure. This is a crocodile rounding numbers board game. Have fun! Math Racing Place Value Game is this fast-paced racing game, kids will identify large numbers in standard and word form. Caterpillar Ordering. A flexible game for ordering numbers and for number sequences. Compare numbers up to billions. Crack the Code- Type the missing number. Missing Numbers- Find the missing numbers in a sequence.